Heading into the 2012 training camp, all eyes were on Andrew Luck and Robert Griffin III to lead a deep rookie class. With the fast emergence of another quarterback, that rookie crop is even deeper. 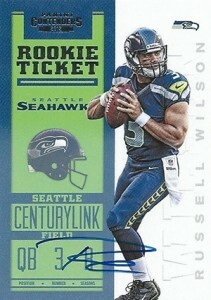 Russell Wilson cards have quickly joined the top-tier of 2012 rookies. He may not be quite to the level of Luck and RG3, but his rapid growth with a strong Seahawks team could easily lead to bigger things in a hurry. Seattle picked Wilson in the third round of the 2012 draft. After starting his college career at NC State, Wilson finished his studies at Wisconsin. He helped the Badgers win the 2012 Rose Bowl. And in just his second season with Seattle, the Seahawks were Super Bowl champs for the first time. 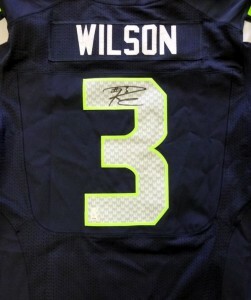 Wilson was the surprise starting QB for the Seahawks at the beginning of the season. It was a move few expected, but an impressive preseason showing made it the logical choice. And it has paid off. On paper, Seattle already had one of the NFL's most impressive defenses. Marshawn Lynch is one of the league's better runners. Now, with Wilson's quick development, the Seahawks are primed with a balanced attack on both sides of the field. 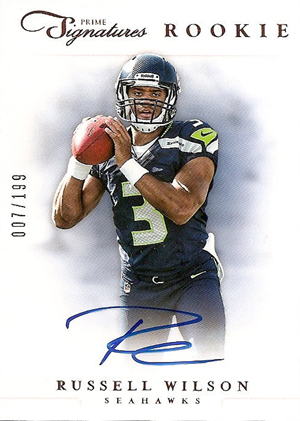 Russell Wilson cards have enjoyed a very fast rise in the hobby. Now that he has a Super Bowl to his name, his values may have reached a peak. Whether they go further will depend even more now on his individual play. 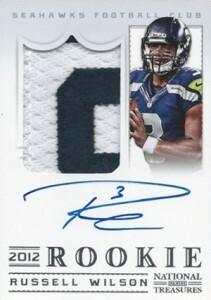 The Rookie Ticket card features an on card signature. The vertical layout provides ample space for a sizable player image to accompany the ticket design. 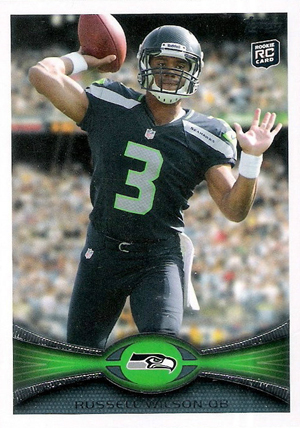 A variation of this card pictures Wilson in a white uniform and commands a super premium. 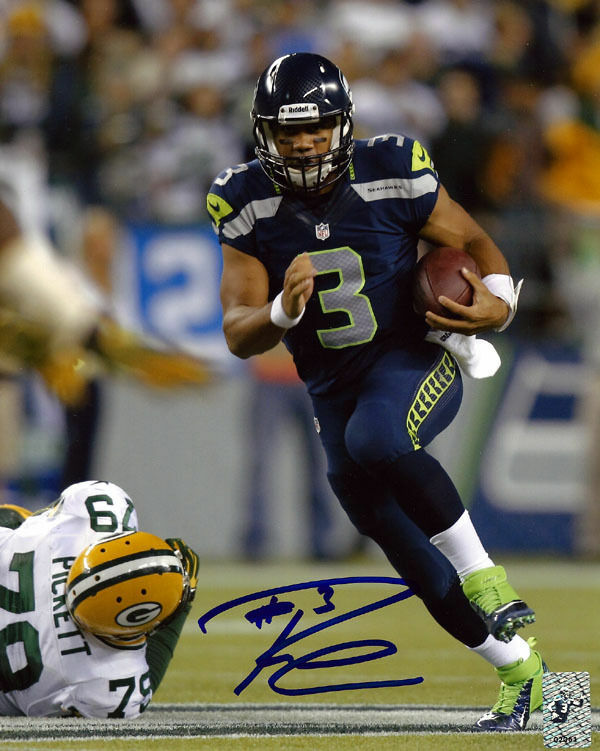 Featuring a jersey swatch and on-card signature, this rookie card from Topps Five Star shows Wilson in an action photo. He has several other cards in the product, all of which are considered inserts or parallels. Serial numbered to just 50 copies, it is his most limited rookie card. This card was issued via redemption and contains a jersey patch and on-card autograph and is limited to 99 copies. 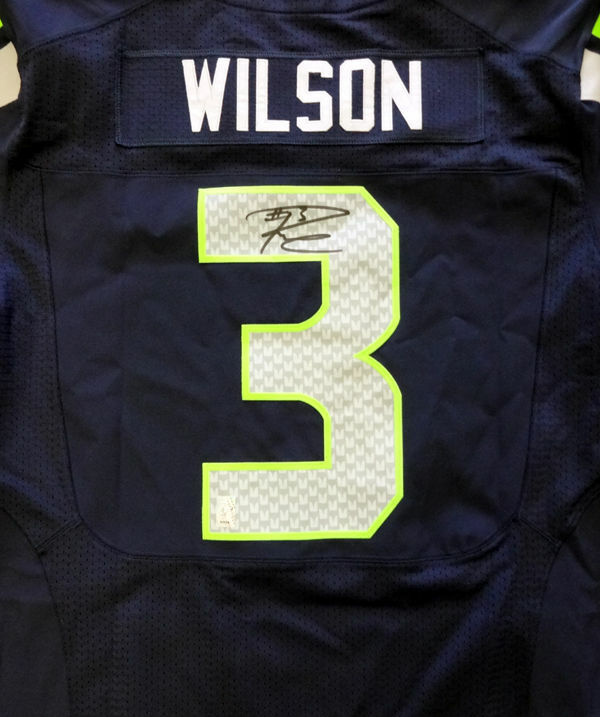 The brand recognition and high-end appeal make it the most valuable Russell Wilson rookie card. 4 Color 2018 Russell Wilson National Treasures Colossal Jersey Patch #07 25! 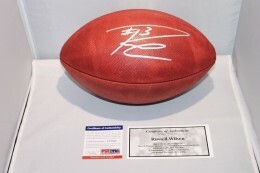 2012 Prestige Factory Sealed Football Hobby Box 2 AUTOS Russell Wilson RC ? 2012 Totally Certified Factory Sealed FB Hobby Box 3 AUTOS Russell Wilson RC ?? 2012 Absolute Factory Sealed FB Hobby Box 2 AUTOS Russell Wilson RC ?? 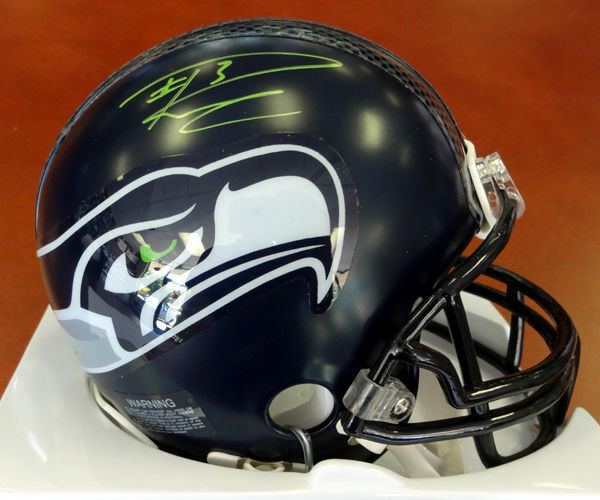 Below you will find an example of what Russell Wilson's authentic signature looks like. This can be used as a first point of reference for determining the legitimacy of autograph memorabilia, but is not a substitute for having your items authenticated by a well-respected professional autograph authentication company. Some of the trusted sources within the sports memorabilia market include the following companies: PSA, JSA, Tristar, and Mounted Memories. 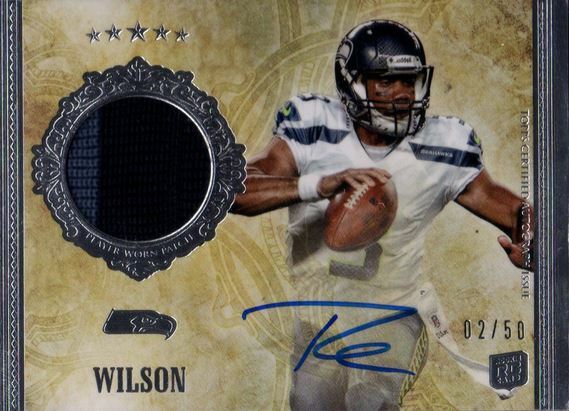 Russell Wilson also has his own authentication hologram stickers. Click on any of the images below to view full size photos. The entire signature consists of the letter "R" and "e."
The "R" which includes a long tail to the right flowing into a loop that looks like a capital letter "D" attaching itself to a right leaning vertical line on an 80 degree axis. The pen doesn't lift as it flows into what looks like the letter "e" with a tail trailing down and to the right. wow! 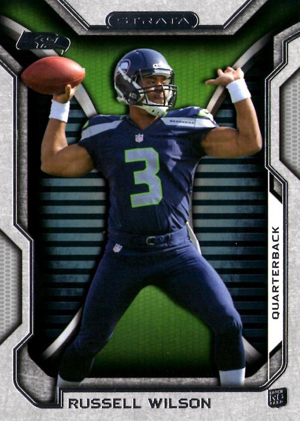 this is an awesome compilation of russell wilson cards! great work!